Test every pin of nearly 20 oft-used computer cables... from 1-pin coax cables to 40-pin ribbon cables. 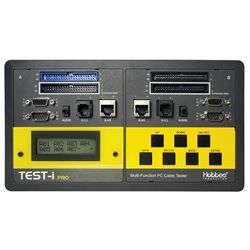 The Test-I identifies opens, shorts and mis-wires at the pin level and remembers up to 100 tests. Use the USB export feature to transfer the test results to your PC for analysis and reporting. Includes carrying case. Requires 9V battery. PC use requires USB 'A' male to 'B' male cable, Microsoft Windows 2000+, and Microsoft Excel 2000+.